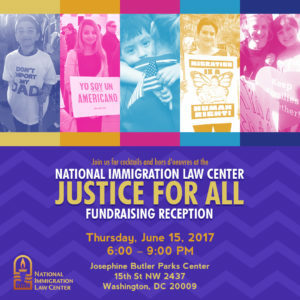 Join us for our 2017 Justice for All Fundraising Reception in D.C. as we fuel our collective energy to forcefully challenge the new Administration’s punitive and repressive policy agenda, and celebrate the accomplishments we’ve made to ensure that low-income immigrants and refugees are treated with dignity and justice. All event proceeds will help sustain NILC’s work to ensure that low-income immigrants and refugees in the U.S. can reach their full potential in the country they call home. Click here to reserve your tickets. Additional sponsorship available. For more information or to reserve a level please contact Acasia Flores at (213) 674-2816.